Pouring wine carefully from a bottle in which loose sediment would otherwise become stirred up. After decanting, (carefully pouring off the clear wine until only the sediment remains behind), the sediment can be washed out of the bottle. Then the decanted wine can be returned to the clean bottle for serving. Decanting is most often done within 1 hour of serving, and usually for old wines only. Bottled wine rarely throws a sediment until well aged and young wines therefore do not need to be decanted. Any glass or crystal flask designed to hold decanted wine and to be used as a server. In decanting, the wine is carefully poured from the original bottle into the decanter and from the decanter into the glasses on the table. Dessert wines (but never table wines) are often stored in decanters for many days or weeks at room temperature. These dessert wines will keep because of their high alcohol content and oxygen-resistant flavours and can be served directly from the decanter on the living room shelf more or less at will. (red grape) Developed at the Freiburg Research Institute, Germany , this is a red-fleshed teinturier cultivars derived from a Pinot Gris and Teinturier cross. Act of removing the frozen plug of ice (containing spent yeast) from a champagne bottle after the riddling. Degorgement takes place on the bottling line just prior to adding dosage and the the final corking of the finished bottle of champagne. See Dosage. The process of removing the stems/stalks from the grape bunches before fermentation. Unripe stems will result in a green, unripe taste in the wine. Any of a class of sweet wines, usually fortified to higher alcohol content, which are served with desserts or as after dinner drinks. Common dessert wines are Ports, Sherries, Muscatel, Madeira, Tokay and Angelica. The process of removing grape stems prior to fermentation, to avoid adding tannins from the stems to the wine. Sparkling wine made from 100 per cent German grapes. Lowest grade of German wine. Quality seal around the neck of a bottle for wines that have passed certain tasting tests. A chemical compound used to quell the problems caused by brettanomyces in wine. Greek god of wine and revelry. See Bacchus. The process of removing alcohol and other volatile substances (especially flavours) from wine to make brandy. Wine is boiled in a closed apparatus in which the alcohol vapor, steam and other volatiles are channeled into a cooling tube, condensing them into a high alcohol content, highly flavoured brandy. After removal or the alcohol and flavour, the residue of cooked wine is discarded. Term used on both German and French labels meaning "a wine estate." Now, also used in the U.S. as part of the names for some wineries. (red grape) Variety developed by the Geilweilerhof Research Institute of Germany from a Portugieser x Spätburgunder cross. Has synonym name Geilweilerhof 4-25-7 . Grown in the Franken region. The wine is deep coloured, as the berries are small. It can achieve higher ripens levels than the Portugieser. (red grape) Recent vine cross (1956) gaining wide popularity in Germany . Mainly grown in the Rheinhessen and Pfalz regions, it is increasingly being planted and produces wines with aging potential. It is a crossing between Helfensteiner (Fr üburgunder X Trollinger) and Heroldrebe (Portugieser X Lemberger) it has large berries and there gives a large amount of juice. It gives a wine with deep colour, but low acidity, synonym name Weinsberg S 341. The few ounces of wine, often sweetened, which is added to each bottle of Champagne after disgorging to make up for the liquid volume lost by disgorging. 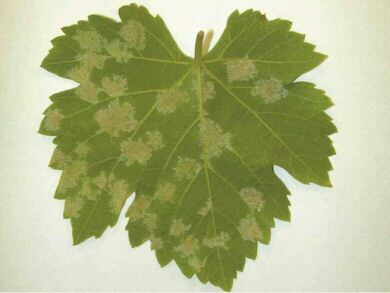 Fungal disease of grape vines which kills the affected tissue. The disease is native to eastern North America but has spread to Europe and most other regions of the world. It does not occur in California because of the low humidity and lack of summer rains. A crush tank fitted with a screen to make free run juice separate quickly from the skins and stems in freshly crushed white grape must. By closing the drain valve for a specified time, the winemaker can "macerate" or allow contact between juice and solids for some varieties, if desired. In a crush tank, the solids left over after the juice has been drained off. This pomace is primarily skins with a small amount of stem bits. Whether in a fermentation tank or in a wine glass, dry means the complete absence of sugar in the wine. In a red fermenter, the solids left over from draining the new wine off after fermentation. Tasting term used to describe a wine which, although always expected to improve, simply never seems to do so. When a wine is described as dumb it means the taster is getting tired of waiting for it to come around and you can probably buy it from him for real cheap. Then, again, why would you want to? (red grape) Developed at the Freiburg Research Institute, Germany , this is a red-fleshed Teinturier cultivars derived from the Portugieser and Färbertraube varieties. The sugar is fully fermented so the wine is fermented to dryness.